Professionalism and refined creativity combined with care, passion and tradition have always been the key elements that distinguish the brand Guidi Lenci, of Filippo and Andrea, in high couture cuisine. Guidi is a prestigious Banqueting company, that offers a wide range of services, for any type of event, from home parties to company meetings, from wedding receptions to art openings and performances. The attention to detail has allowed banqueting to become a true art, where perfection is reached constantly through their meticulous care for detail. Everything starts when Ennio Lenci is not yet born, and his uncle Gino Guidi, who will be as a father for him, will open the first luxury bread store in Florence, Via Marconi 66-68. 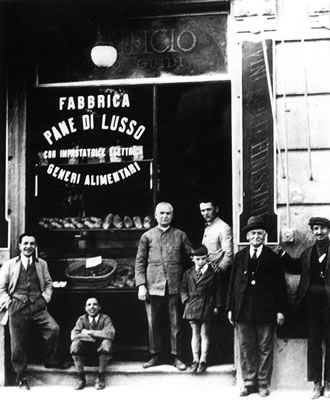 In 1910, just before the World War I, the first major war of the new century, Guidi bakery soon becomes renowned in Florence for its high quality and refined products. The best oils and flours on the market joint to talent and creativity will turn out to be more valuable and irreplaceable when the most difficult social strains occurred. Ennio was born four years after the end of the war in his uncle's home, where he lived since his earliest childhood. Ennio soon learned to appreciate the fragrance of freshly-baked bread, and the ripe smell of newly-pressed olive oil. Uncle Gino taught him all there was to know, and before long Ennio joined him in the business, gradually taking the reins of the business, and adding innovative ideas. Thanks to his efforts, by the late 1950's the classy bakery expanded with a pastry store, which brought further prestige to the Guidi company. Ennio, by then already married with four children, wished to expand the business and dig up his old secret dream, Haute cuisine. This fascinating calling found its origins in his grandmother, a cook working for the noblest Florentine families. Ennio followed her footsteps by organising his first dinners in the houses of the high Tuscan aristocracy, almost to evoke the ancient family heritage. Ennio slowly started his career in haute cuisine, while his older son Andrea was learning the basics of the family business. For the Lenci family the research and production of a perfect product became a legacy and a passion to respect. Thus in the 1970's, the ancient bakery ceased its activity, only to start the Guidi banqueting one. In those years Andrea was ready to side his father, and Filippo, the younger son, also started to work for the family business. Passion and creativity are united to create a unique and exquisite meal for anything like 4 guests to a thousand. A dinner by Guidi is the result of imagination, passion, love for food and attention to detail that fused together create an event tailored especially for the client. Ennio Lenci as a child, outside his uncle's store, currently the headquarters of th Guidi Company. Volevo ringraziarvi di cuore, insieme a tutto il vostro staff per la serata indimenticabile. Il cibo era ottimo (tanto che diverse persone hanno richiesto il bis! ), tutti hanno complimentato l'aperitivo che ci siamo persi ahime, e la torta uno spettacolo (non ci aspettavamo fosse tanto grande! ).